The new Athlon 200GE packs a mere 2 cores and 4 threads, thanks to SMT being enabled. It runs at a frequency of 3.2 GHz and this relatively low frequency allows AMD to achieve a 35 watt TDP rating. Unfortunately this is a locked CPU. I’m sorry to say but for whatever reason AMD’s gone full Intel on us here. Initially I was quite excited about the prospects of tweaking this new budget processor, but the second I found out the CPU cores were locked, I felt a bit crushed. You can overclock the DDR4 memory to help maximize the GPU performance, but still no CPU core overclocking. Speaking of the integrated GPU, it packs just 3 graphics compute units which is very light when compared to the Ryzen APUs, down 63% from the 2200G, so I’m not expecting much. AMD is claiming decent 720p numbers: 65 fps in DOTA 2, 71 fps in CS:GO, 67 fps in Rocket League, and roughly 60 fps in Overwatch, so we're keen to check it out later this month for a full review. As you'll likely recall, earlier this year we received the first Zen-based APUs with the Ryzen 3 2200G and Ryzen 5 2400G, priced at $100 and $170, respectively. These CPUs pack Vega graphics, the 2200G featured the Vega 8 GPU with 8 graphics compute units enabled and the 2400G, Vega 11. Both offer entry level type discrete graphics performance, so for a CPU and GPU with a configurable TDP of 45-65 watts the performance was impressive. Still while a bargain at $100, the 2200G remains out of range for some, or as crazy as it might sound, excessive. Plenty of people are still interested in Intel Celeron and Pentium range, priced between $40 and $100. Not that long ago we checked out the Pentium G5400 and at the time it cost $52, today it offers bad value at more like $70. My conclusion on the G5400 review (at the original MSRP) went something like this: "If you’re not interested in 3D performance and just want a PC for general usage, then the Pentium G5400 is tough to beat. That said if you’re planning to tackle heavy tasks like rendering, encoding and so on then again the extra investment is well worth it as the 2200G was often up to 40% faster." Today we have that sub-$100 AMD processor in the Athlon 200GE, but why Athlon you might ask? Well, AMD like Intel doesn’t want to risk tarnishing their premium product lines with budget low performance products, so Intel reserves the Core naming for their higher end parts and goes with Pentium and Celeron for the ultra affordable models. 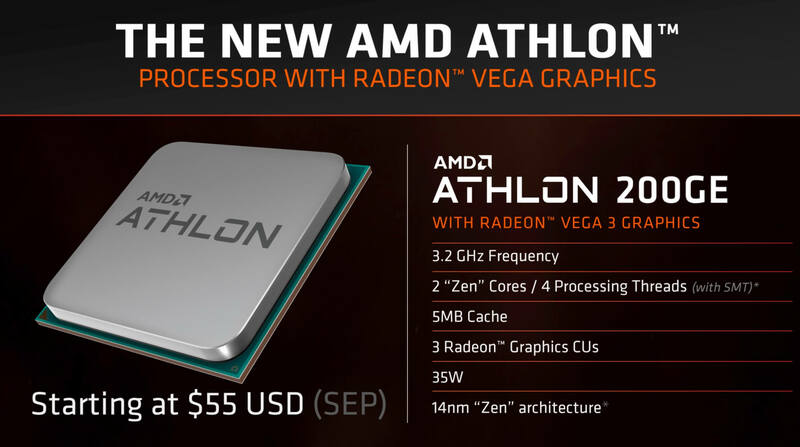 AMD is doing the same by making their ultra affordable Zen processors part of the Athlon family. Now you might be thinking, a quad-core, get the flip out AMD… but a dual-core Ryzen processor with SMT support will be more than capable of delivering smooth performance in a number of popular titles, such as those just mentioned. Also we probably shouldn’t overlook the fact that it comes in at just $55. Throw it on a $50 A320 board and you’ve likely got yourself a pretty great budget combo. I should also note that it’s compatible with the full range of AM4 motherboards so in addition to the A320 boards you can also use it with B350, X370, B450 and X470 boards and AMD says no BIOS update is required for any of those boards. In terms of general computing, AMD has shown it delivering Pentium G4560-like performance. For those unaware, the G4560 is a 2017 release based on the 14nm Kaby Lake architecture. It also packs 2 cores with SMT for 4 threads and a base frequency of 3.5 GHz. I’m not sure why AMD didn’t compare it to a modern equivalent that you can actually buy. The Pentium G5400, for example, is the same processor as the G4560, it just comes clocked 6% higher, which is probably why AMD chose the G4560 as the 200GE can match that chip. Had the 200GE been an unlocked part, it would have single-handedly smoked the entire Intel Celeron and Pentium range. As it stands now it probably only makes sense if you want to take advantage of the integrated GPU. If you plan on getting a discrete GPU of any kind the Pentium processors likely offer a little more bang for your buck. I will say that unlike the horrid AM4 Bulldozer APU series which made about as much sense as the Kaby Lake-X series as a CPU placeholder, the Athlon 200GE does make for an excellent placeholder. If you happen across a decent B350 board for a good price you can throw the 200GE on it and enjoy some casual gaming and then later once funds allow upgrade to a more serious Ryzen 5 or Ryzen 7 CPU. Today AMD are just announcing the Althon 200GE. Normally these budget chips get pushed out quietly but for whatever reason AMD’s making a bit of noise a couple of weeks ahead of the actual release (September 18). We're keen to review the budget chip and and see how well the 200GE stacks up again Intel G5400. Had AMD offered this as an unlocked part I would have been super excited, as it stands I’m worried I’ll end up being disappointed, I mean it’s never going to be bad at just $55, it will be the CPU to beat, but a $55 unlocked 4-threaded Zen+ CPU would have conquered every sub-$100 Intel CPU with ease. What could have been.